The city of Haven is the epitome of what is right with the world, but it does have its dangerous spots. All in all, however, it is a very safe and interesting place to live. The city is growing both physically and spiritually with new technologies being invented on a daily basis. The city authorities and police force are doing their best to make sure that the people of Haven get to live in a safe and clean environment. The organized crime syndicates and secret organizations hide in the shadows that are cast by the twin illuminations of moral standards and civic responsibility. The people do not fear to walk the streets at night, scandal is almost unheard off and your private life is your own. The Empire City is the city of the future. 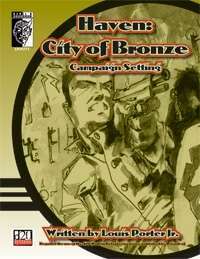 The Haven: City of Bronze Campaign setting provides you with all the information that is needed to start you adventuring in Haven in the Neo-Pulp age. This setting book is 17 pages long and is written by Louis Porter, Jr.